This report presents the World Health Organization's (WHO) expanded strategy to decrease the burden of HIV-related TB. 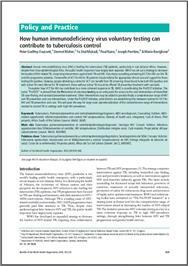 This consists of interventions against TB and HIV with close collaboration between TB and HIV programs. The program promotes voluntary counseling and testing for HIV and TB. WHO is conducting the ProTEST initiative to investigate how HIV voluntary testing can lead to a more effective control of TB in areas with high HIV infection. The report discusses the rationale for the initiative, the elements of this approach, progress, and future direction. Godfrey-Faussett, P.; Maher, D.; Mukadi, Y.; Nunn, P.; Perriens, J.; Raviglione, M.
7 p.: b&w., ill, graphs, refs.